They made over my favorite Starbucks recently, closed it down for a month and unveiled a new décor. 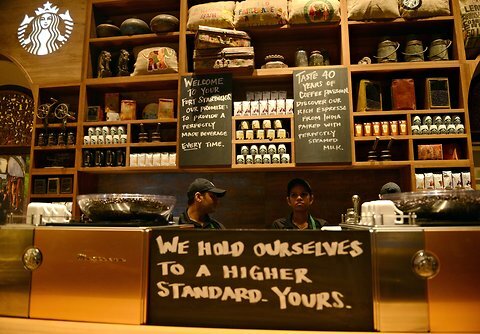 The décor is, very much like the old Starbucks, decorative. It’s intended to be mood altering, soothing, and quietly provocative. Architecture is a pair of glasses that the room holds up to our face to make sure we see it through its chosen lens. Every shape and curve in the world around us, down to the intentional squiggles in this font, provoke minute reactions in our hardwiring. What’s curious to me is where Starbucks just went. They’ve made a geographical move. The Tuscan colors were reminiscent of old world Europe. They were meant to harken back to the historical, so much as it is grandfatherly, to be quaint, to whisk us away to a place with short work days and long naps. It was meant to be a third space that is not only out of the office, it was out of the country. The color palate has changed, though only slightly. It took me a minute to see what they had done. The colors are now more muted and more beige. The burnt orange and avocado are gone. It’s now the color of the desert. The light covers have been replaced with woven basketry. And the picture on the wall, formerly a partial nouveau sketch, is now a zen garden curled in sand. We’ve moved from Italy to India. Traditionally the Starbucks aesthetic is limited to four options: Heritage (worn and dark), Artisan (hand polished woodwork and exposed steel), Regional Modern (bright and lined with fabric), and Concept (experimental). What may have changed is that last October the company opened their first store in India, and they are cross-pollinating. They rapidly expanded in Mumbai and New Dehli, and this month they announced that they are targeting most major cities in India. Market estimates suggest that they may have tapped into 100 million new customers. I don’t know that it lay in the back of the mind of whomever our interior decorator was, and this is literary license rather than observation, but Starbucks just caught the wind of culture and are riding it on a carpet. I like the irony of the non-discriminating not being able to challenge the caste system. So true! It’s like the intolerance of tolerance preachers, valuing chimpanzees more than fetuses, or telling someone they’re wrong for believing in absolute truth 🙂 Wry & right! OMG, only you could write three whole paragraphs dissecting the 4 traditional color schemes of Starbucks stores!!! ← Why Bother Defending an Omnipotent Being?